Mr. Metha Suvanasarn is a specialist in IT Governance, IT Audit and Enterprise Risk Management areas. Currently, he is a committee member, for example, Audit Committee, Risk Management Committee etc. in leading organizations. Usually, he has been invited to conduct seminars and symposium both for public and in-house events, especially on the topic of IT Governance and Enterprise Risk Management and very active for Integrated GRC. Moreover, he is an invited lecturer for doctoral degree in the subject of Enterprise Risk Management at Khonkaen University and GRC Thesis for doctoral degree at Chiengmai University-CMU. He always publicizes several knowledgeable articles on the above areas. He was a senior CIO, and also a core founder of EDP/IS Examination in 1984, at the BOT and announced essential rules and regulations which most of them are currently in use. 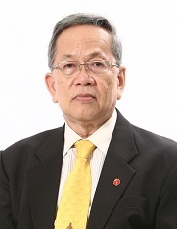 He was a former Vice President of The Institute of Internal Auditors, Thailand. He is currently Vice President at ISACA Bangkok Chapter, Thailand. And also currently, Vice President at TISA-Thailand Information Security Association. 3.1.ผู้เชี่ยวชาญด้าน IT Examination ของ ธปท.